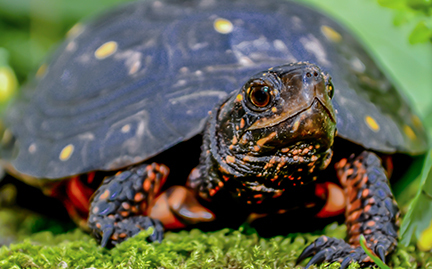 Spotted turtles are semiaquatic. Multiple males may compete to mate with a single female. The female lays two to seven eggs in nests dug in sand or soft soil in sunny locations. The number of clutches laid each year varies with latitude; in the north, less than one per year is laid, while up to three per year are laid in the south. The gender of hatchlings is determined by nest temperature; cooler temperatures produce mostly males, and warmer temperatures produce females.